Travel with us into the distant future in which man plays god by creating angels to protect him. Immerse yourself in an alien world and discover why you were woken up after a long slumber. Meet friends and foes, discover their objectives and most importantly try to stay alive. 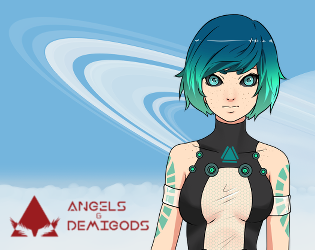 Angels & Demigods is an atmospheric sci-fi visual novel being brought to you in VR. It is a story and dialogue centered game in which you create your own adventure by carefully choosing what you say and do. This is the Alpha Prototype Build of a part of a scene of the game which you can use with Google Cardboard. It's an Android APK and completely free.